After an exhaustive day of shopping, I really only wanted to go home. While I can easily shop for clothes and be out of a store within 10 minutes, Viv can take 10 times as long easily. We already hit the outlets, Ross, Fred Meyer and now Target. The only reason we didn't end up at Wal-Mart was that she suddenly realized the total amount spent exceeded $600.00 in only a 5-hour period. And that was only on clothes... for the kids mostly! They'd better thank us for this... someday. Gawd, I sound like my parents! Thus, we hightailed it out of there and made our way to the border. Of course we had to eat before heading straight home. Nothing too fancy and definitely nothing too expensive either. 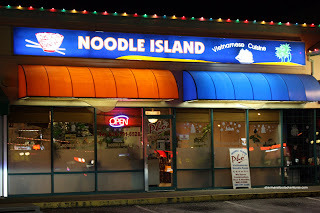 So we decided to drive through Fleetwood and stop off at Noodle Island. 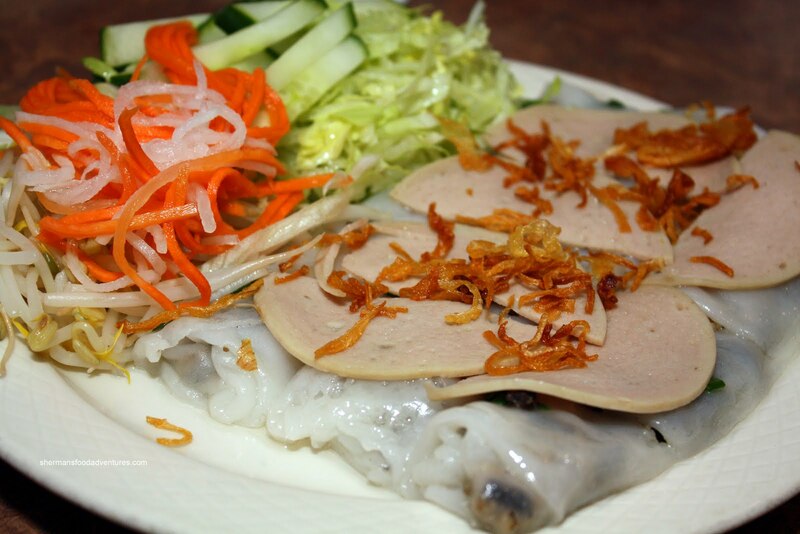 Advertised as a Vietnamese restaurant, we were curious to find items like Broccoli and Beef on the menu. Oh well, trying to be everything to everyone? Well, we weren't here for that so we stuck with the Vietnamese food staring with the Banh Cuon with are rice noodle rolls filled with ground pork and wood ear mushrooms topped with Vietnamese ham, fried onions and served with a fish sauce dip. Also on the side was blanched bean sprouts, pickled daikon/carrots and a green salad with cucumber. For $6.95, the was a fair amount of food. As for the rolls, the noodle itself was made with too much water; thus it fell apart when we tried to pick it up. I did like the tasty filling though. 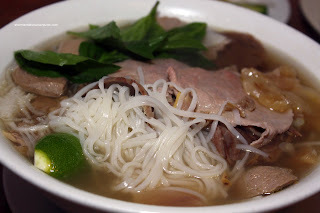 Of course I would have the Pho, in particular the Pho Dac Biet (with everything). Once again, there was a good amount of food for the price. Lots of noodles and tender meat. No complaints there. The broth was on the blander side; yet was still not bad exhibiting some aromatics. 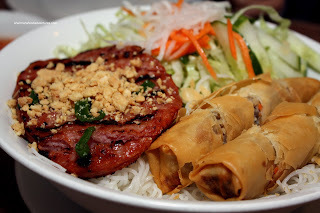 Viv had the Vermicelli Bowl with pork patty and spring rolls. Despite being crispy with a nice filling, it was too bad they used wheat wrappers for the spring rolls. The pork was predictably sweet and salty with nice charring. The picture doesn't do it justice because the bowl was very large. Yes, for whatever the food lacks in execution, it is completely made up in quantity. The prices aren't necessarily cheap; but you do get a lot of food. 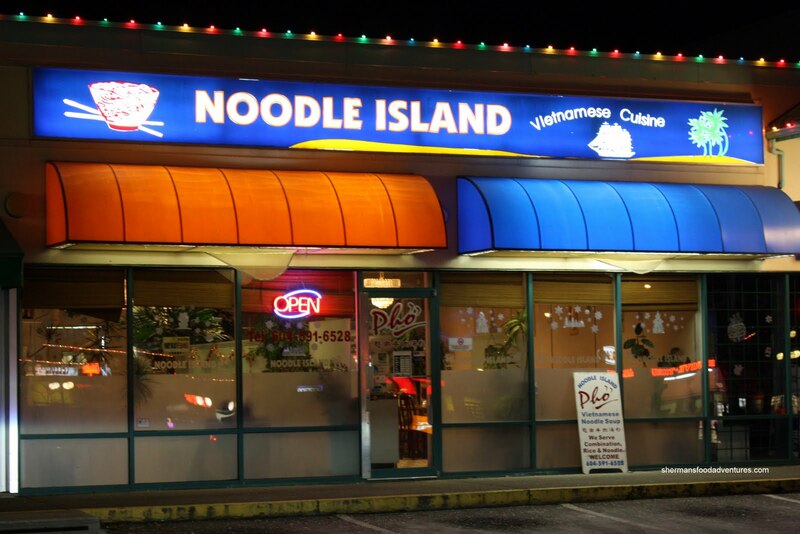 Considering its location, Noodle Island is an okay choice if you are not too picky about your Vietnamese food (or available Chinese food too in this case...). have you ever taken a look at marshalls while you were across the border? it's just another kind of ross! it's a great second option and when i go to both i'm guaranteed to walk away with a hefty amount of purchases. Marshall's eh? Will do next time. Thanks!